When you’re out shopping for speakers for your car audio system, the options can be quite overwhelming. 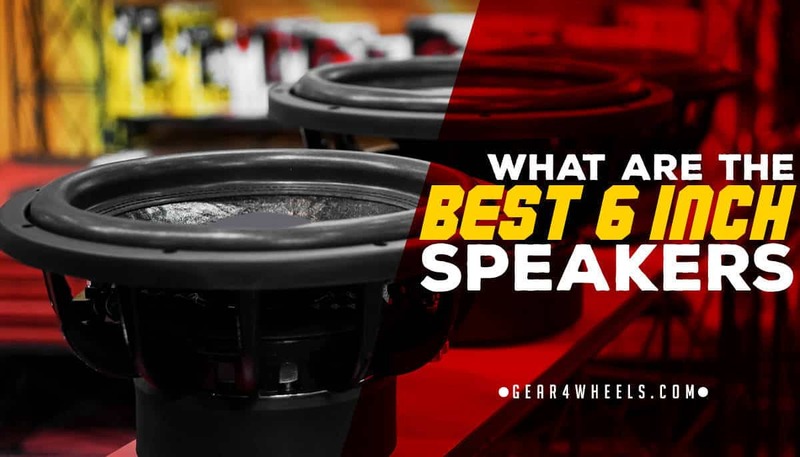 That's the reason earlier this year we did some massive research and comparison between the best car audio speakers on the market. You can read it here. 6” speakers are popular options for audio systems because their size allows for easy installation, no matter the space available. Unfortunately, you simply can’t pick the first item you see because a proper car audio system requires quality in every aspect. The best 6” speakers are designed to withstand shock from both the movement of the car and the speaker unit itself. Vibrations during driving and when the system is turned on can quickly damage a speaker if it doesn’t have proper insulation. Protective layers make a speaker durable so you can enjoy the same level of sound for a long time. Next, the speaker must be able to handle power. Whether you power it via an amplifier or its own head unit, it shouldn’t distort or blow when you increase the volume. The list below mentions some of the best 6” speakers currently on the market. You may notice that these are all 2 way speakers. You can read more about 2 way vs 3 way speakers here. Though there’s invariably one that stands out above the rest, you may take a liking to one based on unique shapes, styles or features. Enjoy browsing through these reviews so you can find the ideal option for your vehicle. Morel incorporates a long list of excellent components in these speakers. You can purchase them in a pack of two. This is usually perfect for use in vehicles so you can get balanced sound throughout the car. If you’re installing a huge sound system, you may be concerned about the weight it adds to your vehicle. However, with these speakers you’re guaranteed lightweight items. Thanks to the light neodymium magnets, the speakers are remarkably light. This also makes for easy installation, since you don’t have to struggle with handling heavy units in small spaces. The mounting depth is only 2.4”, which means you don’t need a lot of space to create an exceptional sound system. Any car can now have a quality system, since most cars do have this amount of space available in door compartments or head units. With these speakers, Morel offers you quite a few extraordinary features. There are items that can be improved upon, but this will influence the affordable price attached to it. Starting with the different speaker parts, you’ll love the fact that neodymium magnets in the tweeters mean the speaker is much lighter than others of its kind. However, the woofers still contain heavier ferrite magnets. Moving to the voice coil wires, you may want to keep on searching for speakers that offer aluminum rather than copper coils. It’s all about quality and durability. Aluminum is known to be a better option, but is unfortunately, not used in this product. The low mounting depth also helps vehicle owners to easily find a place to install them. As most cars are manufactured with speakers of this shape, you may be able to simply swap them out. A﻿lpine﻿ is a well-known name in the audio world and with good reason. There are many reasons why this item is included on my list of best 6” speakers. The best aspect of all is that these quality speakers, made by a reputable company, are sold at a very reasonable price. This enables all music lovers to improve their auditory experience in their vehicles. These speakers offer quality sound on most frequency levels, so you’ll enjoy both high notes and bass riffs. I don’t know of many other speakers that can handle frequencies as high as 30kHz. These are some of the most powerful speakers on this list, as each speaker can pump up to 250W. This is remarkable for speakers of this size, so you can play music at loud volumes, even though you only have space for this sized speaker. The small size means the mounting depth is only 2.95”; you’ll easily fit these into your doors or boot. The wires used in the voice coils are mostly made from copper. Some people prefer aluminum for its durability, but this may be a personal preference. JL Audio supporters rave about the quality of sound these speakers produce. This isn’t only about volume, but clarity and quality too. This concerns both high sound frequencies and low notes, so you know you can enjoy any type of music through these units. If you want to push the volume, these clear notes will continue without distortion. The quality and balance of sound is further enhanced by built-in crossovers. With crossovers already in place, you also don’t have to build black boxes for them, which helps those who don’t want to modify their vehicles too much. As with most of the items on this list, you can purchase them as a set of two. I love the unique design of some of the components; their covers are made from see through plastic, so your car audio unit will sound great and have aesthetic value. For those who prefer the classic black and grey look, you may have to keep searching. JL Audio knows what customers look for and that’s why their products land on my list. They cater to every imaginable occurrence. With this product, grilles are included in your purchase. If you attempt a DIY project when improving your car’s sound system, you can make sure it looks neat by simply installing these grilles over your speaker units. The classic name of this manufacturer hints at the classic style of the speakers. Their classic round shape and dimensions mean they should easily replace any vehicle’s standard speakers. Unfortunately, this is not the most powerful speaker on the market. If you’re looking for high volumes, this will not suffice. It also doesn’t allow very low bass sounds to come through effectively, so you won’t feel the music as much as you’re hearing it. I found my ideal 6” speaker in the Morel Integra Ovation XO. This powerful and durable speaker will give you excellent sound for a long time before showing signs of distortion. Even in terms of weight, it only affords benefits, proving how Morel really went the extra mile to offer customers an excellent option. This is all worth the slightly elevated price; it’s worth every penny when you hear the improvement these units bring when comparing it to what you currently listen to. Trust these units and you won’t be disappointed.